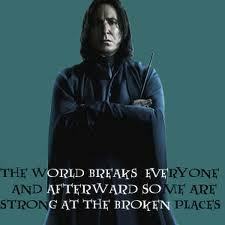 Strong At The Broken Places. . Wallpaper and background images in the severus snape club tagged: severus snape potions master harry potter proffesor alan rickman. This severus snape fan art might contain capa. So true about our beloved Severus !